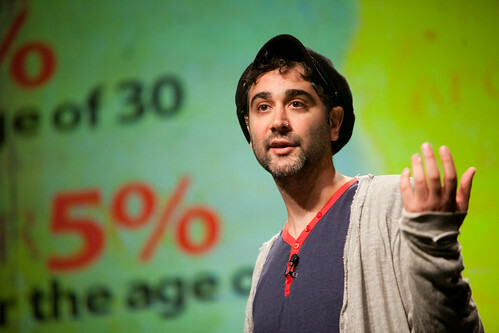 I first met Saman Arbabi the night before my opening keynote at SXSW 2012 in Austin, Texas. My friend Raina Kumra insisted I attend his talk, Iranian Outlaws: Satire vs. Censorship. I was so impressed and moved by his presentation that I asked to include some of his slides in my own keynote talk the next day. As creator of the shows Parazit and OnTen, what Saman was doing with satire, politics, and media was a perfect example of what I had dubbed “civic satire” (comedy with a political and media mission), and I was happy to shine a light on his work. Saman and I have since become friends, and he has moved from Washington, D.C. to New York City. He invited me out to Bushwick Brooklyn this past weekend to see an art wall he was installing to mark the four year anniversary of the Iranian elections / uprising / crackdown. It’s called the Inside Out Project and is inspired by street artist JR.